As you drive along Hwy 101 during your Olympic Peninsula Labor Day weekend, the wineries in Port Townsend, Sequim and Port Angeles are right along your route. 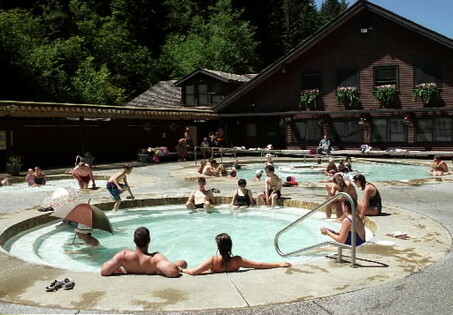 The Olympic Peninsula is a great place to vacation any time of the year, but Labor Day is the traditional last hurrah for summer vacationers. There’s a big surge of travelers to our area, seeking that last taste of summer. What better way to taste it than to spend your Olympic Peninsula Labor Day weekend visiting our local wineries! All the wineries of the Olympic Peninsula will be open that weekend. For quick reference, below are the Olympic Peninsula Wineries’ hours during Labor Day weekend. For full information on hours throughout the year, please visit each winery’s page on this site or their respective websites. In addition to the fun of touring our wineries, pick up some local wines for your Olympic Peninsula camping trips or hiking, kayaking and biking excursions. There are so many ways to enjoy the natural beauty of our waters and mountains. A bottle of award-winning Olympic Peninsula wine adds just the right touch when you’re looking out over the Strait Juan de Fuca, or walking among the stately old growth trees of the Hoh Rainforest. Keep a few extra bottles to take back home or join the wine clubs to keep the Olympic Peninsula wines and fond memories flowing all year long. From all of us at the Olympic Peninsula Wineries, we wish everyone a fun and safe Labor Day Weekend. 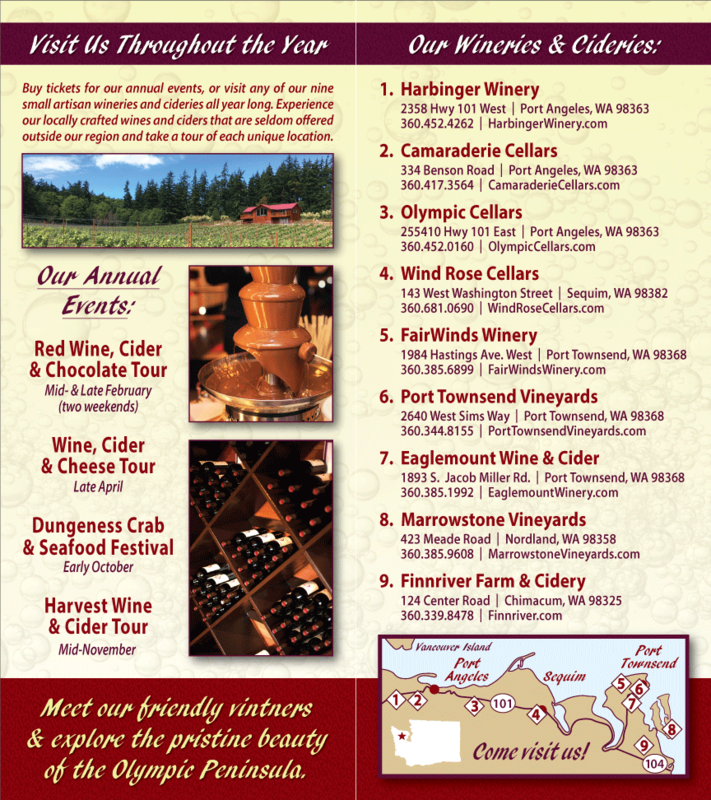 We’d like to extend heartfelt thanks to everyone who visited our Washington State Wineries and Cideries in 2011. Thanks for journeying to the beautiful Olympic Peninsula. Thanks for taking the time to visit us, taste our wine and cider, and chat with us about what we do and why we do it. We all love what we do, but the work wouldn’t be nearly so fun if we couldn’t share our wine and cider with you. We hope to see you again in 2012. Walk to the New Dungeness Lighthouse, on the tip of Dungeness Spit in Sequim. Perched on the end of the Dungeness Spit in Sequim, the New Dungeness Lighthouse is far from new. Yet today it is as remote and beautiful as it was more than 150 years ago. It’s worth a look the next time you’re visiting the Olympic Peninsula. Since the weather is supposed to be great during the next couple of weeks (at last! ), plan a trip soon. Dungeness Spit is the world’s longest natural sand spit, extending five miles into the Strait of Juan de Fuca (and growing every year). There is no quick way to get to the lighthouse at the end of the Spit – visitors must walk five miles to the end of the Spit and five miles back. Those who do are rewarded with stunning scenery, wonderful wildlife, fresh air, and peace. A walk out to the New Dungeness Lighthouse is a fantastic way to celebrate a special occasion. It’s an incredible experience, even on the most blustery days. Once at the lighthouse, visitors are rewarded with amazing views from the top of the Lighthouse tower. On clear days, the Olympics, the North Cascades, and Mount Baker will knock your socks right off your feet. Several picnic tables are located out by the lighthouse, and driftwood chairs are abundant on the beach. Picnics should include a bottle of Washington State Wine from the Olympic Peninsula – to celebrate your surroundings. Celebrate the return trip with a stop at one of the nearby Olympic Peninsula, Washington State Wineries. Olympic Cellars, Harbinger Winery, Camaraderie Cellars, and Black Diamond Winery are all located in Port Angeles. All offer wine tasting. 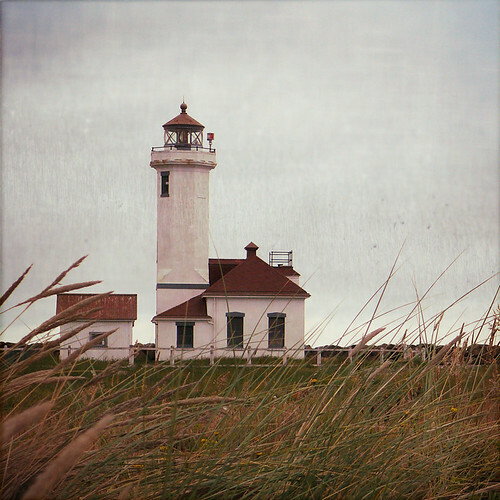 It is possible to travel by boat to the New Dungeness Lighthouse. Advance notice must be given to the National Wildlife Refuge at 360.457.8451. If you’re interested in becoming a volunteer lighthouse Keeper, please visit New Dungeness Lighthouse. Travelers to the Olympic Peninsula have long gone there to find stunning scenery, rain forests, and unparalleled outdoor activities. Back in the day few travelers expected to find great food or wine. That has changed. These days, people exploring the Olympic Peninsula come across restaurants that have been written up in the New York Times (Fins, in Port Townsend). They find hand-crafted pizza made in wood-fired stoves at Sequim’s Alderwood Bistro. They find elegant garden dining at the Cafe Garden in Port Angeles. They also find award winning Washington State Wine and cider. When next you head to the Olympic Peninsula, be it to hike, admire views from Hurricane Ridge, or spend time in a historic seacoast town, be sure to bring your appetite. 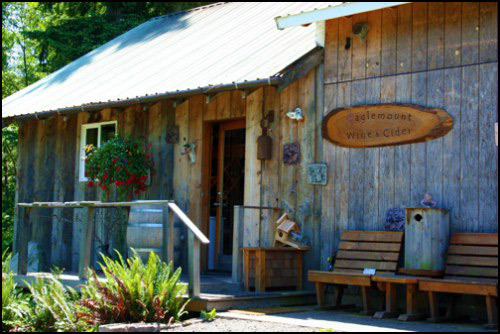 Allow time to stop by one of the Washington State wineries in Port Angeles and Port Townsend, where you may taste hand crafted Washington wine. Visit a picturesque cidery in the Chimacum Valley, and taste cider made from Washington apples. You’ll be happy you did. Gray Skies? Drink Washington Wine. If you live in the Pacific Northwest, or indeed anywhere on the west coast, you may be feeling a bit down. We live through months of gray skies secure in the knowledge that come summer, our skies will be blue. “Sure it can be rainy”, we tell friends who live elsewhere, “but when the sun comes out, no place on earth can match its beauty.” So where are you sun? View of Victoria from the Olympic National Park, outside of Port Angeles. Well, those of us who make Washington State Wines can’t make the sun shine in Washington State, but we can help to cheer you. Head to the Sequim area – if it will be sunny anywhere in western Washington, it will be sunny here in the Olympic Rainshadow. Stay awhile, and taste Washington wines and ciders at our seven wineries from Port Angeles to Port Townsend. A little time on the Olympic Peninsula can make anyone feel better. A walk out to the lighthouse at the tip of Dungeness Spit, in Sequim, is magnificent no matter the weather. 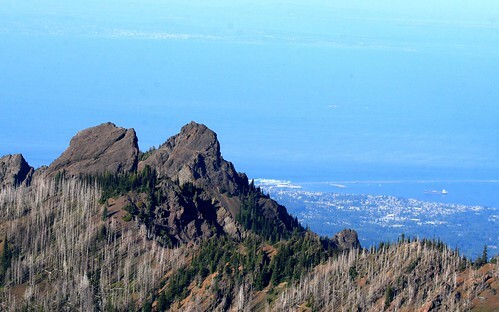 A drive up to Hurricane Ridge, outside of Port Angeles, is sure to raise your spirits. 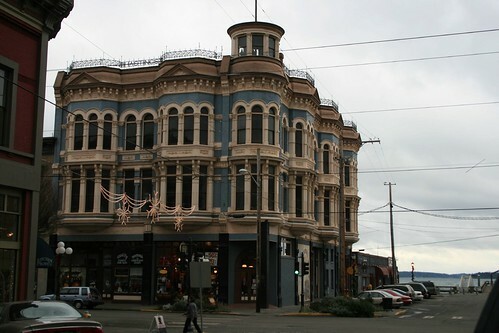 Dinner in historic Port Townsend tastes good, rain or shine. It is imperative to include wine tasting in your Olympic Peninsula holiday. After a drive up to Hurricane Ridge in the Olympic National Park, stop by Harbinger Winery, Camaraderie Cellars, and Black Diamond Winery. 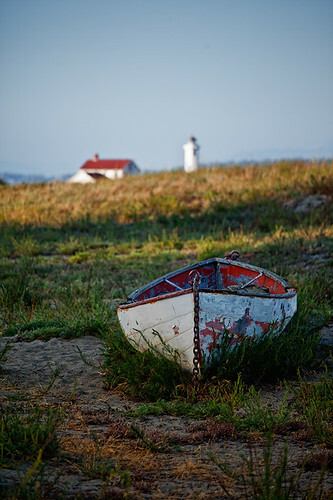 After a walk on the Dungeness Spit, visit Olympic Cellars. On your way to Port Townsend, enjoy a cider at FinnRiver Farm and Cidery, in Chimacum, and once in Port Townsend, stop by Sorenson Cellars and FairWinds Winery. To keep your spirits raised, pick up a few bottles of your favorite Olympic Peninsula Washington Wines and take them home. That way, no matter what the weather does, you can find solace in a glass of good wine. If you are heading to Sequim April 9 -11, 2010, for the Olympic Peninsula Bird Festival, be sure to leave room in your schedule for tasting Washington State wines. The Olympic Peninsula Bird Festival is chock full of interesting events. Participants may chose from several morning and afternoon field trips, photography workshops, or Northwest Raptor Center tours. Rise at dawn to listen to the Chorus of bird calls by the Dungeness River, and take the Owl Prowl once darkness falls. Cruise to Protection Island, and bid for unique items at the Silent Auction. All this sounds like great fun for birding enthusiasts, but also exhausting. When you feel ready for a bit of a rest, consider a trip to one of the Washington State Wineries near Sequim. A visit to a tasting room will restore your spirits and prepare you for the next activity at the Bird Festival. In addition, you are likely to find a Washington State wine that you would like to enjoy at home. Olympic Peninsula Wineries produce a limited number of cases each year, enabling us to focus on quality. The best chance you have of sampling our wines is in our delightful tasting rooms from Port Angeles to Port Townsend. Bring your binoculars to the Olympic Peninsula Bird Festival, and leave with Olympic Peninsula wine.